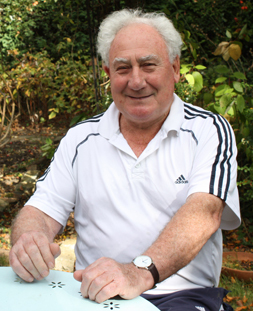 Tom McNab has been a key figure in the sporting world for over 60 years. Having personally won five titles in the Scottish triple jump his skills as an athletics coach have enabled Greg Rutherford to become the world’s leading long jumper and the English rugby team to bring home the silver in 1992. Also equipped with some considerable artistic brawn McNab worked as technical director on the film Chariots of Fire and has written several radio plays and novels including best seller Flanagan’s Run. During the course of the interview McNab demonstrates incredible humility as well as a refreshingly objective stance on the 2012 Olympic Games. Questioning him about his upcoming play 1936 we somehow manage to cover a plethora of subjects ranging from Hitler’s rise to power to Conan Doyle’s belief in fairies. An absolutely fascinating man who it was a pleasure to interview. What is your play 1936 about? Essentially it’s about the period between 1933 and 1935 in the lead up to Germany hosting the 1936 Olympics. It’s following the path of Hitler who wasn’t terribly keen on having the games; Goebbels had to convince him. During this time America decided that they’d have a vote on boycotting the games because of Germany’s discriminative politics. It’s basically a political play about the world’s unwillingness to face the issue of the persecution of Jewish sportsmen. In the end the Americans only put forward two and a half votes out of a hundred in favour of going. It was very tight indeed between going and not going. If they hadn’t gone, we probably wouldn’t have gone and the empire wouldn’t have gone either and the games would have fallen apart. What do you think would have happened had the 1936 games not gone forward? Well the Olympics were very much an internal PR vehicle for the Germans and for Hitler; it stimulated the self-esteem of the nation. Germany had been a very powerful sports nation but they were taken out of the 1920 and 1924 Olympics because they lost the war, they only came back in 1928. I think if they had pulled out after training these athletes for two or three years and also after creating the biggest stadium that the world had ever seen I think it would have been a tremendous blow to German pride. Hitler was in a relatively fragile position at this time. The upper classes didn’t like, him, the generals didn’t like him and the games not happening could very well have had a big impact upon whether or not he moved forward with war as quickly as he did. If you look at his behaviour prior to the Olympics such as when he sent his troops into the Rhineland in 1936, he told the generals to come back if they experienced any resistance. Whereas in 1939 he just sent the planes in and they blasted the hell out of Poland. He wasn’t nearly as confident in the period that I’m dealing with as he was later on, after the games. Do you think that Hitler’s popularity being increased by the games enabled the Holocaust? Well, it’s all hypothetical and it’s impossible to predict how differently things could have turned out. The initial plans in about 1934 were to send the Jews of Germany off to the Baltic. There was the possibility of sending them to Madagascar, then some of Hitler’s acolytes thought of sending them to Palestine. Bernard Baruch suggested to Roosevelt that they create a Kenyan Jewish state. But there was great difficulty finding a country to accept so many Jews, even the Americans placed a limit on it. Surprisingly the one country that did offer to accept a thousand Jews was Panama. So Hitler’s initial thought was not to kill them all but rather to send them elsewhere. The gas chambers were a much later thought. So what we now see as inevitable; nothing is inevitable. There were over a hundred attempts on Hitler’s life, but if in the 20th of July Plot, the briefcase with a bomb in had been moved by about three feet, Hitler would have been killed and hundreds of thousands of lives would have been saved. So history is often predicated on very small things. It’s a bit like a kaleidoscope; every time you shake it you get a different pattern and I think the same is true of life. Sometimes you shake it and your life is never the same. So is the play about cause and effect; how one event can facilitate such a range of outcomes? That’s not what the play’s really about, no. It’s much more about the political implications of Hitler accepting the Olympic Games and America’s reaction to Germany at the time. They only confirmed they were taking part a couple of months before the Winter Olympics started, so it was touch and go if they would even arrive. The main character is athlete Jessie Owens isn’t it? Yes it is, I was lucky enough to meet Jessie Owens and his coach in 1964. We’ve got a very good young actor playing Jessie; he’s outstanding. How was his role significant in 1936? It was an unusual situation; Jessie was asked by the American officials if he would be willing to lead a black boycott at the Olympics. But Jessie himself was discriminated against and he said that even if he could convince all the others not to compete he wouldn’t even try. He was being asked to boycott something because of Jews being discriminated against in Germany, but black people were being discriminated against in America. It wasn’t exactly the same, but it’s not dissimilar. In fact I’m going to an event today with Tommy Smith who gave the Black Power salute on the podium in 1968. He’s bringing out a book and a film. I was in the stadium when it happened and I had no idea where that had come from at the time, I was really pretty dim about what was happening to black people. So what the play explores is the paradox of trying to get a boycott vote in a nation in which racism is endemic, i.e. the United States. You’ve written several novels and radio plays. Is this your first stage play? My first play being performed in a professional capacity yes. After getting married to my present wife Jenny Lee who is directing 1936, she suggested writing stage plays. I’ve written a play called Houdini and Sir Arthur which was performed for charity here in St. Albans; it’s about Arthur Conan Doyle and Houdini who were very good friends. Conan Doyle was a great spiritualist, even believing in fairies and Houdini became very much anti spiritualism which eventually destroyed their friendship. I’ve also written a new play about Leni Riefenstahl, the woman who made the 1936 Olympics movie. But I was a late starter; I was seventy when I started. So I’m an old person but I’m a young playwright. 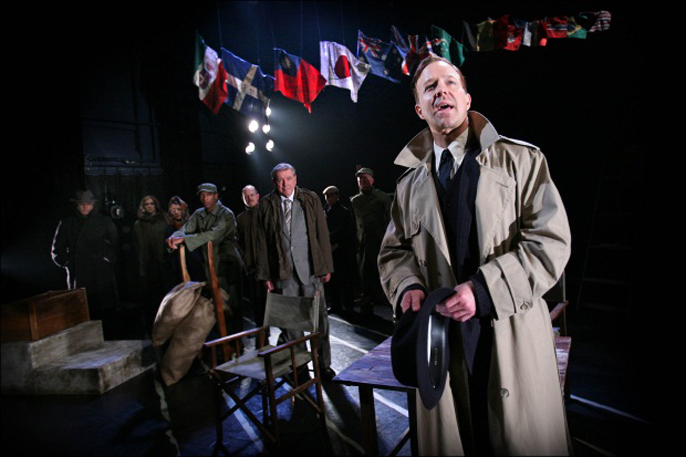 How does writing stage plays differ from other genres? Well, with a radio play it’s all done with the voice and straightforward descriptions of the setting. In a novel you’re in charge of the whole thing whereas if you wrote a play or particularly a film, there’s a vast number of other people that come into the process. I’m going to a reissue of Chariots of Fire at the Leicester Square Empire tonight and the first time I saw the film I realised that the gap between the script and what appeared on the screen was massive. 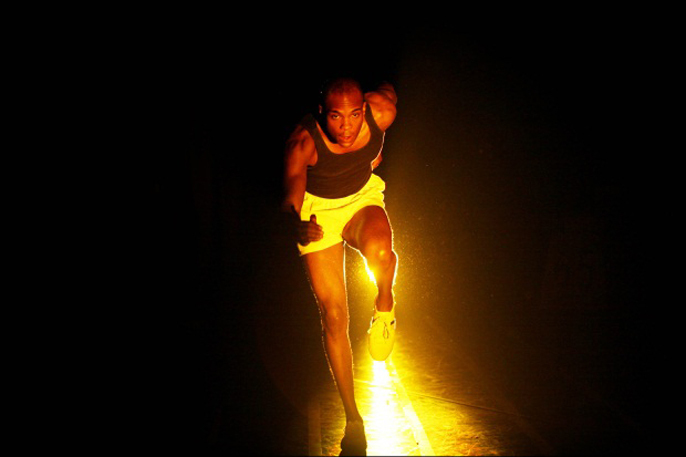 Have you seen Mike Bartlett’s stage version of Chariots of Fire? Oh yes, it was excellent. The dialogue is actually taken directly from the film rather than the screenplay. I sent Bartlett and the director Edward Hall a copy of Flanagan’s Run each to show how much I enjoyed it. I had my doubts about turning into a play but I thought it was first class. I think they took a fairly simple look at it and got it dead right. Have you any plans to return to athletics? I do, yes. I plan to compete in the hammer in two years time. The teams are divided into age groups; I’m 78 now so I’m going to start at 80 so I’ll be at the bottom of that age category. That way the other competitors will be older than me and I’ll stand a good chance. I work out at the gym every day so I think I can manage a 3.25kg hammer. Am looking forward to a renaissance at 80. You’ve trained some outstanding athletes, what skills do you need as a coach to make a world class competitor? You can’t put in what God left out. I could never have made it as a long distance runner if you’d have held red hot pokers to my backside because I was not built for distance running. You’ve got to have the basic physical skill to start with. Also you’ve to have someone who is willing to explore their talent to the very limit and there’s not many people like that. That spark has to exist before you can blow on it and turn it into a flame. There’s of course technical knowledge and being able to teach that successfully. And finally you’ve got to have passion for what you’re doing. You’ve got to get people over injuries, over disappointments and all sort of thing, it’s not just a mechanical process it’s a human process. It’s rather like a recipe; we could both have the same recipe for apple crumble but yours turns out marvellous and mine turns out rubbish. Just having the information and the knowledge isn’t enough; it’s being able to form that into something that works. One thing is absolutely certain; if you don’t give people opportunity, they won’t achieve. That’s why you’ve got people like Cameron and Osborne from Eton and St Pauls and they’re sharp, but there are people as good as them and better from the comprehensive system but they’ve never had the chance to get anywhere near power. In the year 2000 something like 60 per cent of our Olympic team who won medals came from the independent sector which is only seven percent of our population. We’re still an incredibly divided society, the Labour party in 1945 could not have believed we would be like this in the twenty first century. It’s gone backwards; inequality and the gap between the rich and poor has increased in the last twenty years. What do you think about disruption the Olympics has caused to Londoners and the funding going so over the initial £2 billion budget? You can’t make an omelette without breaking eggs and there’s no way you could do something like the Olympics without dislocating large numbers of people. But I think the regeneration of East London will almost uniformly positive and wouldn’t have happened without the Olympics. We’ll have the aerodrome with a magnificent swimming pool which will be used for public use once the Olympics are over and there’ll be sports programmes centred around there that weren’t there before. So in that local area there’s going to be a tremendous regeneration physically and spiritually. Things like tourism: no. I don’t think there will be any more tourists coming to Britain. In terms of going so over budget, that’s a negative. It was almost inevitable, but one unforeseen expense has been the budget for security; you’ve got to remember the day after we got the bid was July the 7th, if the decision had been made a day later the games would have gone to Paris. But I think to be fair if we had known it would cost so much we wouldn’t have done it, there’s no point in trying to sweeten the whole thing. But now we’re into it and you’ve got three magnificent weeks of sport. Whether that’s worth £9.4 billion pounds I don’t know, but there’s been a recent assessment indicating that something like £16.4 billion will come as a direct result of the Olympics. Whether that will actually happen I don’t know. How political is the 2012 Olympic games? Well any Olympics is political as you’ve got to make political decision about making bids for it, who’s funding it and so on. There may be some attempts at political demonstrations during the games; we have no idea where they’re going to come from though, like Tommy Smith’s demonstration in 1968 was totally unforeseen. Really all sport is political; every country is supported by its government in terms of funding for sport whether local or national. So your local swimming pool is a political act on the part of your community. In terms of the legacy of the games, there’ll be no legacy of greater sports participation. A little boy sitting at his computer is not going to be motivated to take up a sport because he sees Usain Bolt ploughing down the track. Bolt is so far from his experience it’s impossible to emulate someone like that. His role models are likely to be his mother or his father, his auntie or the woman next door who drives people to the cancer hospice. These are people whose life experience is close enough to his to make it possible to emulate them. If you hate physical education and you’re no good at sport, seeing the Olympics will not change your life. If it’s not going to enhance tourism or increase the nation’s fitness, what do you think the Olympics will achieve for Britain? Well for sport it will give us a tremendous boost internationally. I think it will also give us an immense national boost as it’s been a massive piece of organisation. It won’t encourage a little girl sitting at home to take up running, but it will encourage a lot of young of people in athletics to redouble their efforts, you saw that effect with Kelly Holmes. You get emulation when you’re already involved in something, so I think for sport it will do a lot. Do you think it will inspire national pride? It will increase national pride, but it's a temporary thing. Having said that we’re now reaching a point where we realise that we’re not inferior as a nation, we’re one of the most successful countries in the world. We've got the best performance system on earth; we’re the best cyclists, we’re the best sailors, some of the best swimmers. Even gymnasts; we can beat the Russians in something like gymnastics now which was absolutely inconceivable a few years ago. I think if you have the best in your society beating the best from other countries in the world it can only be positive in terms of the way you perceive your country. Why is the Olympics important in the 21 century? Because it represents excellence at its highest level. It represents physical and psychological excellence. It represents people right at the edge of their abilities, the fact that they’ve pushed their bodies and their minds to the very limit of human endeavour and shows what we as humans can achieve.